We are Red Chillies Supplier. Our dry red chillies are made available in both finger as well as powdered forms. Indian red chillies are used for treating number of dishes and cuisines like sauces, chutneys and pickles etc. 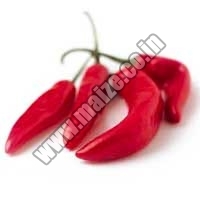 Apart from this, we are one of the most important red chillies Suppliers and Exporters in India. The Indian Red Chillies provided by us are of excellent quality. These can add nice color and a distinguished taste to the delicacies. Our Dry Red Chillies are highly demanded by customers. Even if we have many bulk orders for Red Chillies with us, we are able to deliver every order within stipulated time frame. We also check the quality of the Red Chillies before dispatching them. We are known as a reliable supplier, and endeavor to provide best quality to customers. We offer our Red Chillies at market leading prices to customers. Customers can place their order at any time during the year. We have vast infrastructure that includes ware houses and testing units. We never dispatch the Red Chillies without testing them in our testing units. We never give any chance to our customers to complaint, neither for quality nor for delivery of Red Chillies.